EW Energy is an intermediary of suitable heaters. By entering the data, suitable providers are proposed to the user. 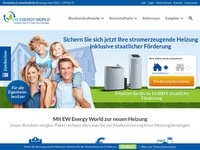 In addition, EW Energy helps the user to apply for appropriate funding. A lead is counted when the user specifies the valid name, zip code, telephone number and email address on the start line.